Hudson Conger of the Novice BB Stars (left) battles a pair of Stirling Blues players for puck control. Photo by Adam Prudhomme. The Napanee Midget Stars continue to lead the Eastern Ontario League standings, adding four more wins to their record this week. Friday in Campbellford, they controlled their hosts 7-2 in a penalty-filled contest, in which goalie Emerson Kennelly gained the win. Sunday, in Wellington, facing the County team, they earned an 8-0 shutout- the third time they’d defeated PEC in eight days. Hosting Douro, they played well to top their visitors 6-4. Kyle Garrett and Oronhyathe Green each had a pair, while Corbin Gibson and Ryan Kirkpatrick contributed singles. Goaltender Murray Craig earned the win. -The Joyce’s Meat&Deli Atom Stars also remain at the top of the heap in their division, with a perfect record in league play following their 17-1 win over Centre Hastings in Madoc, and a 12-0 shutout on the road in Brighton. -The Napanee Exit Realty Acceleration Bantam boys were full marks for their 2-0 blanking of Gananoque Sunday night on the road. The Exit Realty squad are in second place in their league, with Tweed close behind. -The Atom AE squad hosted Tweed on Sunday falling 6-1 to their guests. The lone goal was scored by Brock Boutilier, assisted by Peyton Brooks. Carter Cork was busy between the posts. -The Peewee AEs were also roughed up 5-2 by Brighton Saturday afternoon. Carter Slaven got them on the scoreboard, with a goal and assist. Jacob Cox chipped in a tally as well, while goaltender Ben Buxton worked hard to keep it close. 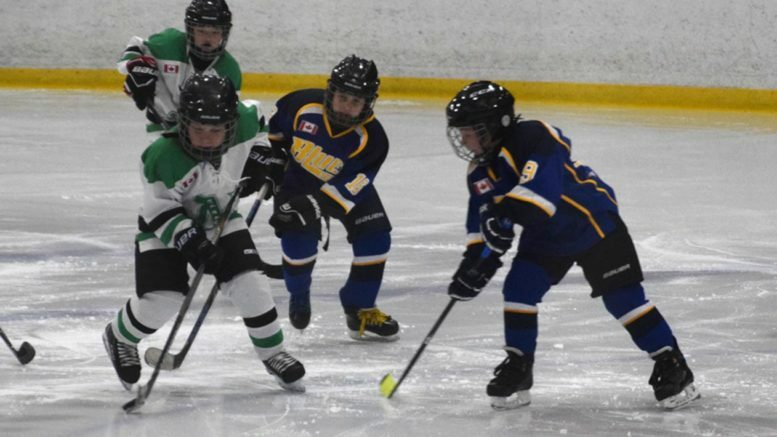 -The Napanee Novice team faced Stirling at the SPC on Sunday, losing 4-2. Keagan York scored twice and Mason Whalen and Liam Mulder had assists. Ethan Sabramsky-Nichol patrolled between the posts.